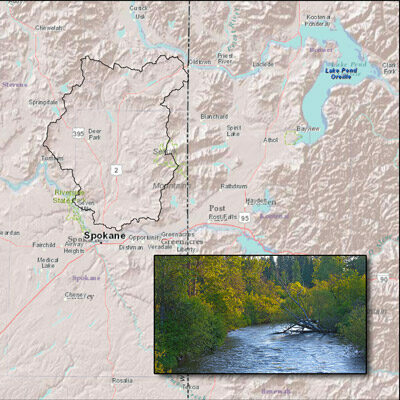 The Little Spokane River Basin, also referred to as the Little Spokane Water Resources Inventory Area 55 (WRIA 55), includes an area of 679 mi2 in northeastern Washington State covering parts of Spokane, Stevens, and Pend Oreille Counties. Streams originate in the northern part of the basin and contribute flow to the Little Spokane River, which flows southward about 49 mi from just south of Newport, Washington, to its confluence with the Spokane River, about 5 mi northwest of the City of Spokane. Important aquifers in the basin occur primarily within unconsolidated sediments that include glacial flood deposits and recent alluvium. Basalt aquifers also contribute water to some wells in the southern part of the basin where the basalt underlies the unconsolidated sediment or occurs at land surface in remnant basalt mesas. Crystalline basement rocks provide generally limited quantities of water in the higher elevation areas of the basin where the other more-productive units do not occur. The Spokane Valley-Rathdrum Prairie aquifer, a large regional groundwater system occupies a small area of the southern part of the basin.